@Diablo posted a follow up Friday on a question from Thursday, about the Barbarian‘s Revenge skill. Here’s the original question, plus the second round. Grug said what a number of you guys said in comments, that the skill change sounded like Revenge had been made into a passive skill. Instead it’s a “proc.” Whazzat? Like most RPG terms, it’s covered in the Reference section of the DiabloWiki. ” Proc” can be used as a noun or a verb, the term seems to have been popularized in Everquest, and it’s commonly used in WoW as well. (Of course!) Basically it’s a “process” that triggers automatically, some % of the time. 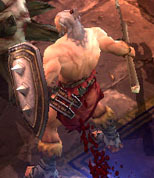 For example, critical hits are procs in Diablo II, since as a character uses say, the Electrocute skill, every hit has a % chance to trigger a lightning critical hit. Hence Revenge is now a skill that, once invested in, will trigger a fast spinning counterstrike by the Barbarian, automatically, some % of the time. (Rather than requiring the player to click it, as at last year’s Blizzcon. We don’t know of any other skills that only work as procs, but perhaps others have been added since Blizzcon? It would seem odd if Revenge were the one skill that works in this way, after all. We do know that Runestone effects will add proc effects. For instance one Runestone in Zombie Dog gives a dying Mongrel a % chance to spawn a health orb when it dies. I can envision procs as a useful rune bonus to lots of other skills, too. Imagine the Monk’s combo skills gaining a % chance to trigger a Frost Nova, or the Demon Hunter’s arrows to trigger a stun or knock back. Does that sort of function bonus seem cool to you guys as a Runestone effect? A sort of bonus added on top of the base skill? Or do you want whole new functions and graphics for your skill rune effects, like you get with Hydra and Weapon Throw and Plague of Toads? I think AH/trade system will be done solely by battle net and not in game. it easier to have access to all characters gold and inventory through stash and shared stash by battle.net to trade form on the auction block instead of going to a in game hub. Revenge’s description on the skill calculator page says: “Revenge has a 10% chance to become active for a short time when you are hit by an attack.” This seems to indicate that it’s a reactive skill. My guess is that the skill is not usable under normal circumstances, and is only available to use when it “procs” off of you taking a hit. Something like Revenge from warriors in WoW, only it has a 10% chance to activate on hit, rather than on dodge/block/parry.